What the Internet of Things mean for you. Along with the advanced development within modern technology, the Internet of Things (IoT) is one of the media’s most popular concept when it comes to the exciting opportunities for the future. Healthcare in specific will be revolutionized through the amount of possible applications IoT will bring about. Over the course of this article, I would like to discuss the fundamental concept of IoT and then utilizing a framework designed by McKinsey to see analyze how applications are currently affecting healthcare. I will then touch on my specific thoughts when it comes to shifts in the healthcare space for the future. Finally, I will discuss the barriers facing the industry and steps that could be taken to overcome them – thus, resulting in the maximization of welfare for individuals on a global scale. 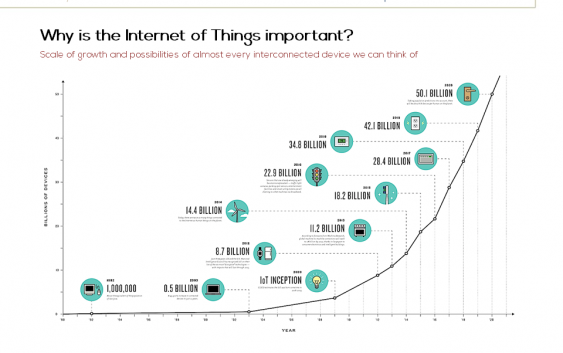 The Internet of Things is a fairly general term, however has been acknowledged as a network of devices. Embedded with sensors, devices can effectively communicate and leverage data acquired by other devices. Each individual computer or person made up a network which became the current internet as we know. Essentially, the Internet of Things is similar by through the interaction of multiple objects that have electronic capabilities. Thus, a good comparison to understand the potential growth opportunities would be to compare Earth before the development of our modern internet with an Earth as we know it now. Not only was there no source of sharing information or collaborating on worldwide projects, but there was no social media or easy methodology for sending complicated information. Technology analysts have been so excited with the Internet of Things because of the rate at which the industry has been developing. In 2003, there were approximately 0.5 billion devices in the market. However, this is expected to grow to 50.1 billion devices in 2020 representing approximately a 10,000% growth or 30% CAGR. With more data touch points, objects or “things” will be able to more easily leverage an ever-growing resource for artificial intelligence and predictive algorithms which can dramatically increase convenience for the average citizen. McKinsey & Company took a look into technology companies who had utilized IoT and had effectively managed to reach the forefront of the adoption phase. McKinsey developed a framework that summarized the distinct types of applications that were emerging within the market. It split applications into two broad categories of information and analysis, and automation and control. In summary, these six metrics with three in each category allowed for improved analytics and optimization of business processes. In information and analysis, the framework broke it down to three sub-segments of tracking behavior, enhanced situational awareness, and sensor-driven analytics. Automation and control was split into process optimization, optimized resource consumption, and complex autonomous systems. The diagram below further explains each of these categories and sub-segments along with examples of real-life applications related to it. The framework can easily be used to analyze recent developments which have occurred in the healthcare industry. Such trends relate to how Internet of Things and advanced technology have begun to instigate tremendous innovation opportunities. Tracking Behavior: First of all, one prominent development has been the increased use of wearable technology. Features with wearables has enabled users to reach data touch-points on personal health from an individual’s heart rate to how many calories they burned in their last workout. As a new found data source, wearables will allow individuals to push the boundaries of possibility. Enhanced Situational Awareness: A paper by the University of Sydney suggests utilizing the data for the benefit of public health. Although there may be fundamental issues with maintaining user security, the medical industry is unique in that data can still be useful if it were to be anonymized. Extrapolating from their thesis, data being used to improve personal diagnosis decisions are certainly in reach. Sensor-Driven Analytics: Microsoft (NASDAQ:MSFT) has created their own program to help the implementation of IoT on healthcare called Azure IoT. By using predictive maintenance and real-time monitoring, it suggests the improvement of patient care, chronic disease management, hospital administration, and supply chain efficiencies. On another note, sensor-driven analytics will help to change how prescriptions are given out for the better; increased sensor capabilities means more accurate diagnosis processes for patients. Process Optimization: In terms of optimization, Forbes highlighted its thoughts on reducing device downtown through remote monitoring and support. It went further to explain the proactive fulfillment of replenishing supplies similar to developments initially seen in the Smart Fridges. With a more efficient management of data, hospitals will be able to improve productivity through initiatives such as effectively scheduling patients. For instance, when comparing how two MRI systems interact and how often they were being used at two different hospitals, the ability to access an MRI may mean the difference between life and death for a patient. Often there is one MRI that may be overused compared to the other. IoT could effectively determine the better timing or scheduling so that more patients can be reached. Optimized Resource Consumption: A reevaluation of payment techniques may be possible in the near-future for doctors. A report in Gartner suggests that with so many touch-points available to evaluate a patient’s health, that it may be more effective to tie a doctor’s payment to their performance and the outcome of their patients. Complex Autonomous Systems: These systems have much in common with the concept of preemptive treatment and the education on the variety of resources available to people. For example, Bloomberg recently highlighted that Gilead (NASDAQ:GILD) had developed a drug called PrEP which could be used to prevent HIV transmission. Despite being an innovative breakthrough in healthcare, the drug was not being promoted because the product had low margins for the company. This profound error is simply a result of the structure of the industry. Thinking optimistically, with advancements in IoT, the healthcare industry may be able to redevelop and understand the implications of some complex autonomous systems. Taking another perspective on IoT’s effects, healthcare space can be split into three different segments: the hospital room, medical research, and the patient at home. Each segments has differing shifts which is predicted. For example, in the hospital room, there might be an increased efficiency in terms of operations, but we might also see the development of patients being able to get treated at home. Within these three segments, in the long-term (~20 – 30 years), the healthcare industry may begin to focus on much more distinct fundamentals. First, a decreasing dependence on the hospital room. With streamlining of operations in terms of both timing and patient diagnosis, there will likely be an increased focus on the patient at home with more readily available medical information and diagnosis capabilities of wearable technology. Lastly, there will likely be the most change in the medical research space. At the moment trials limit investigation and each researcher having to undertake their own experiments. Medical research will dramatically change with the increased amount of data available and the increased need to analyze this vast amount of data. For instance, if Charles were a researcher and he was looking for a cure for a new flu, Charles might spend increasing amounts of time looking at data already available to him instead of planning his own research investigation. In healthcare, there are three prominent points to be addressed. The first of which is the developing measures which are available with IoT and wearable technology. The next two points have to do with how these trends will affect the at-home diagnosis concept and the optimization of hospital processes. Current sensors on the market and readily available to the market include fitness, vital signs, blood constituent, and ambient sensors. Devices which incorporate this technology are already available in the market in some of the examples listed. These measures will be useful in determining what a patient is experiencing in terms of physical activity, caloric burn and intake, blood pressure, blood glucose, BMI, and sleep pattern. The key question to consider is when someone will be able to integrate these measures for the public and private healthcare industries. One of the most interesting innovations that will available in the future, is the provision of health information and analytics. Oftentimes, going to the hospital is frustrating with the extensive line waits for trivial matters such as nose stuffiness. Applications such as WebMD’s symptom checker will work to solve this. By walking through these screens, individuals can simply pinpoint the issue relevant and based on their symptoms, WedMD will suggest some conditions that they could be experiencing. In the future, people will witness applications that can provide similar services but in a progressively more automated, interactive, and personal way. This demo provides insight into what an example mobile application might look like. This applications works in two main ways, firstly, by being able to diagnose an individual at home and secondly being able to provide preemptive analytics on an individual’s health and recommendations on how to solve medical problems. However before an application like that can be developed, there are a few fundamental problems to tackle. Two of them involve data extraction and privacy. To be able to analyze data, there needs to be individuals that are willing to provide data, and a promise of privacy for its users. Moreover, the difficulty of determining how a system could be developed to meet these needs. Robert Steele and Andrew Clarke of the University of Sydney proposes this framework to solve this. To develop a public healthcare architecture that could easily be accessible for individuals on a global scale, it may be beneficial to create a cloud-based platform which can greatly improve application flexibility. Regarding data providers, there have been many public health groups that have expressed interest in subscribing to participate. In terms of the architecture itself, transmission is done through data requests or data collection. In addition, there will be an anonymizing layer to hide the identity of all data providers because what is important in the medical industry is not the effect for each and every individual, but the aggregate data to show trends. This layer will be established by using MIX networks or onion routing. Moving forward, if modern developments of the internet of things continue, there will be dramatic changes when it comes to public healthcare and hospital visits. One of the most prominent issues in healthcare, is the inefficiencies in timing or scheduling when it comes to hospital visits. This diagram accurately portrays the lost time which is spent waiting in the hospital visit process. In the future, this will speed up for two key reasons. First is the implementation of better scheduling applications which can reduce wait times and second, the prominence of at home diagnosis. Doctor consultations will pivot from more of an identification (diagnosis) stage to more of a verification one that looks over the data acquired by wearables. In private healthcare, a pivot of its current value proposition may be needed for the future. Considering the development of the public healthcare, private healthcare will find it harder to differentiate itself with better service or quicker hospital visits. The industry will change primarily in two ways. Firstly, current private healthcare companies will begin focusing on more niche markets or ailments uncommon to aggregate population as the internet of things and medical information will allow for easier treatments of these issues both at home and through public hospital visits. Secondly, with an increased need on medical research, the entrance of many wearable technology and consulting firm may occur. An interesting factor to investigate is the change in private healthcare depending on the given healthcare model. Evidently, the changing value proposition would mean different things for different countries. In mixed models, there will be a shift back towards public healthcare. In the public model, with increasing productivity, the outcome is more straightforward – increased demand. However in the private model two different outlooks can be seen. In the short-term, countries like the United States will lead innovation because their doctors have more monetary incentive to innovate. However in the long-term, once technology becomes integrated into the public model, there will be little need for the current private healthcare model. Furthermore, another interesting alternative would be for the amalgamation of the private and public healthcare models with progressively more similarities. Although the University of Sydney’s framework suggests targeting interested consumer groups or having individuals opt-in as the best method of data extraction, a better alternative may be for governments to obtain information from wearable technology companies. This highlights the likelihood of an increased importance of medical research. The entrance of IT consulting firms such as IBM (NYSE:IBM) or Accenture (NYSE:ACN), which can process the data provided by wearable tech will improve their prominence. Driven from a saying commonly used to describe Big Data, many say finding relevant information is like finding a needle in a haystack. Finally, this section summarizes past discussion and a few recommendations moving forward to maximize the impacts on the industry. Three main barriers face the integration of the internet of things in healthcare, however 5 others are further investigated in the appendix. The first of these big issues will be data security. A prominent data breach, the Target (NYSE:TGT) hack, accurately exemplifies this problem. It is suggested that Target could have been initially hacked through their air conditioning system being compromised. Such extreme circumstances demonstrates the ever-increasing need for cybersecurity. Rapid development are certainly foreseen tokenization and cryptography measures. Another issue revolves around establishing a connection. It is difficult to create the pictured “ecosystem” if there are legal disagreements or arguments between the sharing of information. The last issue was an issue brought about by the changing mechanics of the industry. In most countries in the world, a prominent change is the reverse in the age pyramid with an increasing number of seniors who didn’t grow up with technology. Thus, making applications which are simple to understand will be important moving forward. Finally, as a recommendation, this 8 step framework summarizes past discussion to maximize the effects of IoT. This steps are effectively: development, connections, interest, establishing a network, analytics, personal diagnosis capabilities, research funding, and then optimized hospital scheduling. In summary, these steps will be able to maximize the probability to overcome barriers mentioned and work on improving healthcare worldwide.